The Landmarks Foundation said plans by Tarmac to extend its sand and gravel quarry close to Thornborough Henges, near Ripon, would be a "tragedy". The foundation said: "We strongly urge the council to reject the application." Tarmac already has a quarry at Nosterfield, close to the ancient henges. The new site at Ladybridge Farm is also near the henges, which consist of three earthworks built in a line running north-south for about a mile. Their fears have come to the attention of the Landmarks Foundation, which says its mission is to conserve sacred sites and landscapes around the world. In a letter to the Yorkshire Post, Landmarks Foundation director Sam Green said: "Over the years we have successfully intervened and protected the great statues of Easter Island and other threatened sites in South and Central America, Bhutan, India and Turkey. "We are now turning our attention to Thornborough Henges." 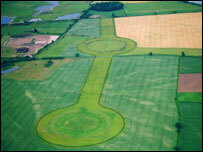 He described the site as one of Britain's largest ritual gathering places from the Neolithic period. "A belief that such an invasion, as represented by the proposed quarrying operation, was impossible has kept us from voicing our opinion up to now," said Mr Green. "This belief was based on knowing that England, of all the countries in the world, treasures its sacred sites and would protect them from all threats. "But it seems our faith was misplaced. "We hope that those with the power to stop this tragedy will see the magnitude of the loss that would result from this quarrying." A Tarmac spokesman said the planned quarry extension was on farmland on which there was only "thin and scattered" evidence of prehistoric activity, according to a recent study by archaeological consultants. Archaeologists would be present on the site and if they found anything of significance, they had the power to stop quarrying activity, he added.